Octavius' Blanket - monemades Webseite! In our Ravelry group, Cyclical Swaps, we often welcome new babies with a group project: a baby blanket made from squares knit from people all over the world. The last one was for Laurel’s Octavius (and the nick name is to be translated literally) and Laurel wished for a blue and grey colour scheme and the use of the wonderful animal motif patterns by Elaine Fitzpatrick, which you can see and download from her blog, Down Cloverlaine. 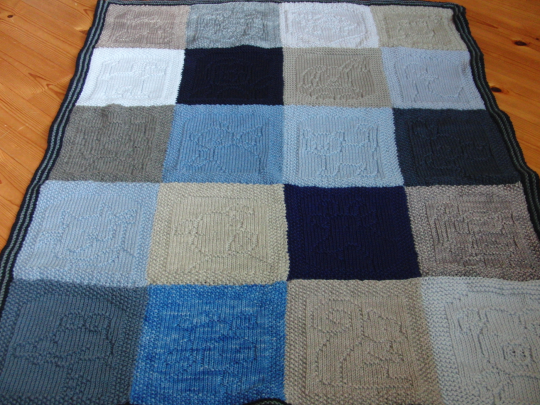 I volunteered to be the ‘sponsor’ who assembles the blanket and it was such fun when all the squares kept arriving. But I admit it was hard work too… so difficult to decide which square to place where and also to even out the differences in size, thanks to all the different yarns used and the individual tension of each knitter. Now the blanket is done and already winging its way towards its new home in the United States. Fingers crossed it’ll travel quickly and arrives at Laurel’s home in time for Octavius’ birth to give the wee one a warm welcome from her knitting buddies.